Two boards similar to the teen boards but with the numbers 10 – 90 printed on them. Place all the beads at the top of the mat and then lay out the cards and boards in the same way as in the Teens Presentation. Give the correct names (ten, twenty, thirty, etc) three at a time in a Three Period Lesson. Once the child knows the names for all of the numbers, read through them forward and then backward with the child. Take out and place all of the beads onto the mat. Then place the 1 card to make 11 in the top slot. Place a ten-bar and a unit next to the cards. Have the child count and say how many there are. Ask if that is what the cards say. Yes. Have the child change the cards to read 12. 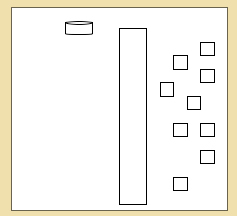 Once you have made 14, show the child that we can simply point to the ten-bar and automatically know there are ten. Repeat until the child has formed 19. When you reach 20 (made by a ten bar and ten unit beads), have the child take a ten and exchange it for the ten unit beads bar to make 2 tens. Ask if the cards say 20. No. Take the 9 card out of the slot and ask if there is a place that says 20 (the second slot does). Have the child bring the two ten-bars down next to the second slot. Add a unit next to the two ten bars. Have the child count: 10, 20, 21. Ask if that is what the cards say. No. Have the child add the 1 card to the 20 to make 21. Repeat in this manner until 99.
show the child that twenty is two tens and so for the up to ninety. To teach sequence, the numbers from 11 to 99.